PhD student at the Center for Public Administration & Policy, Virginia Tech. This article makes a case for regional approach to promoting sustainability. To this end, regional sustainability is conceptualized in terms of four dimensions: environmental, physical, social, and economic. For this article, regional approach to sustainability implies policies, programs, and other initiatives taken by regional organizations such as councils of governments, regional planning councils, or associations of governments that can directly or indirectly contribute to promoting sustainability within or outside of a given region. Summarizing a number of practical as well as normative arguments regarding sustainability, the author demonstrates that pursuing sustainability goals is not just fulfilling moral responsibilities but such pursuits can also benefit the society as a whole. Finally, employing arguments from regionalism literature, the author explains why a regional approach to sustainability can be the most effective and efficient in the United States. Although the term “sustainability” has been in use for a long time, its meaning as well as significance has changed since the 1970s. Owing to a number of publications such as the Club of Rome Report (Meadows et al. 1972), the Declaration of the United Nations Conference on the Human Environment (Sohn 1973), and the Brundtland Commission Report (Brundtland 1987), sustainable development has emerged as a new development paradigm. Thus, the term “sustainability” has acquired new meaning and significance and has drawn attention of scholars, policymakers, and professionals from different fields. As the term “sustainability” is being used by a large number of individuals and organizations in disparate settings, the term has different meanings for different users (Jacobs 1999). The widespread use of the term by a large number of stakeholders has created a situation where its meaning is seldom precise and often confusing (Solow 1991; Phillis and Andriantiatsaholiniaina 2001). Thus, to bring clarity to the sustainability discourse, I briefly discuss the concept of sustainability. I define sustainability as the continued productivity and functioning of the socio-ecological system (region, in this case) while aspiring for a certain level of wellbeing within as well as across generations. I conceptualize regional sustainability in terms of four dimensions: physical, environmental, social, and economic. Although the concept of sustainability has gained popularity in the recent decades among scholars, policymakers, as well as practitioners, critics either deny or downplay the concerns of sustainability (McCright and Dunlap 2011; Leiserowitz et al. 2011; Schaefer and Miller 2015). Therefore, in this article, I offer a number of arguments—practical as well as normative—supporting the pursuit of sustainability. While sustainability initiatives are often top-down in approach, the implementation of the United Nations’ Agenda 21 has led a number of countries to consider sustainability from bottom-up, that is, initiatives by local and regional agencies (Happaerts 2012; Bruyninckx et al. 2012; Jörgensen, Jogesh, and Mishra 2015). As multiple approaches are adopted to promote sustainability and sustainable development, a question arises: which approach is the most appropriate approach? In order to answer this question one needs to consider contextual factors such as the size of a country, the number of local governments, the political and the administrative system, among others. Considering various contextual factors, I argue that in the United States (US), a regional approach—metropolitan as well as rural—is the most appropriate for promoting sustainability. By region, I mean a geographically contiguous and socioeconomically relevant area that includes multiple local jurisdictions. Regional approach to sustainability has the potential to solve many of the complex social, economic, and environmental problems that metropolitan regions face. By way of promoting sustainable development, regions can improve their environment, address poverty and inequality, and also gain economic advantage by investing in and promoting environmental technology related industries such as alternative energy. In what follows, I first discuss the concept of sustainability in general and then I conceptualize sustainability in the regional context in terms of environmental, physical, social, and economic dimensions. Then I defend the pursuit of sustainability from practical and normative viewpoints discussing a number of challenges that regions face as well as normative arguments regarding sustainability. I demonstrate that pursuing sustainability is not just fulfilling moral responsibilities but such pursuits can also benefit the society as a whole. Finally, employing arguments from regionalism and urban studies literature, I explain why a regional approach to sustainability makes the most sense in the US. I conclude the article by summarizing the key points and outlining a future research agenda. The concept of sustainability is broad, which includes the literal meaning as well as the ecological interpretation of the term sustainability. In the literal sense, sustainability means continuity through time (Shearman 1990) and in the ecological sense sustainability implies “the existence of the ecological conditions necessary to support human life at a specified level of well-being through future generations” (Lélé 1991: 609). Ecological conditions refer to the human abilities “to use the environment” and the laws that “determine environmental responses to human activities” (Lélé 1991: 609). The notion of sustainability goes beyond the idea of mere continuity. While some scholars suggest that sustainability should aim to sustain a certain level of utility or welfare across generations (Howarth 1995; Barry 1997), others consider environmental and social justice as goals of sustainability (Dobson 1999). Sustainability aims to “ensure a better quality of life for all, now and into the future, in a just and equitable manner, whilst living within the limits of supporting ecosystems” (Agyeman and Evans 2003: 5). Sustainability is a systems based concept (Barbier 1987; Gray 2010). It can refer to the characteristics of the entire system or any subsystem(s) under consideration. Thus, one can either talk about the sustainability of the entire system or the sustainability of any subsystem such as economic, ecological, environmental, or social sustainability. Sustainability of socio-ecological systems “depends on the interaction of economic changes with social, cultural, and ecological transformations.” (Barbier 1987: 103). A socio-ecological system can be defined as “a system in which people depend on resources provided by ecosystems, and ecosystem dynamics are influenced, to varying degrees, by human activities” (Chapin et al. 2009: 2). For this article, I define sustainability as the continued productivity and functioning of the socio-ecological system (region, in this case) while aspiring for a certain level of wellbeing within as well as across generations. This definition highlights two key elements of sustainability: continuity and aspiration. Sustainability, thus, refers to both continuity—a descriptive component—of the physical system as well as functioning of the ecosystem at a desirable state—a normative component. Therefore, the pursuit of sustainability has two goals: one is descriptive and the other is aspirational. The functional goal of sustainability is to ensure the continued functioning of the ecosystem, and the aspirational goal of sustainability is to attain a better quality of life not only for humans but also for the non-humans. Sustainability is a multidimensional concept. Scholars discuss different dimensions of sustainability such as environmental, social, and economic (Yunlong and Smit 1994); planet, people, and profit (Elkington 1997); environmental, cultural (social), and economic (Kohler 1999); geographical, physical, cultural, temporal, and personal (Seghezzo 2009). Other scholars focus on dimensions such as environmental, social, economic, temporal, and developmental (Hanss and Böhm 2012); environmental, social, economic, and individual, and technical (Penzenstadler, Femmer, and Richardson 2013); environmental stewardship, social well-being, economic growth, technological advancement, and performance management (Joung et al. 2013); planet, people, prosperity, peace, and partnership (United Nations 2015); and ecological, environmental, economic, technological, social, cultural, ethical and political dimensions. (Corson 1994: 207). In these conceptualizations of sustainability, three dimensions—environmental, social, and economic—receive the most attention, although there are many more dimensions discussed by other scholars. The fact that different scholars define sustainability differently focusing on disparate dimensions validates a point noted earlier—that there is no one correct definition of sustainability; it is perceived by different authors differently. Different conceptualizations of sustainability reflect a wide variety of perspectives. From a regional perspective, it can be argued that physical sustainability is central to the notion of continuity. Thus, I conceptualize sustainability as a four dimensional concept with environmental, physical, social, and economic dimensions. 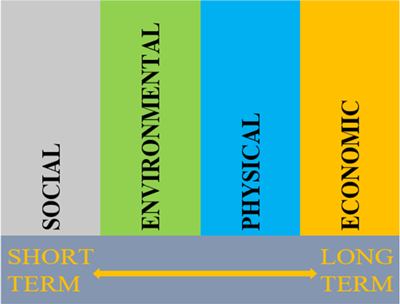 Figure 1 shows four dimensions of sustainability along with temporal aspects. Substantive Dimensions and Temporal Aspects of Sustainability. While all these dimensions are important, this study does not attach any particular weight or order to any of these. The temporal aspects of sustainability also constitute an important concern for policymakers and planners (Corson 1994; Howe 1997; Hanss and Böhm 2012). The temporal considerations help understand short-term impacts as well as long-term consequences of natural disasters and man-made crises. This is helpful in prioritizing what is more important: short term adaptation, or long-term mitigation, or both. Thus, the temporal considerations of sustainability can be helpful in guiding action. In what follows, I briefly discuss the four dimensions of sustainability. Environmental: The environmental dimension of sustainability includes concerns for natural and built environment (Banai 2013). Major concerns of environmental sustainability include high levels of pollution, poor air and water quality, ecological imbalance and high ecological footprints (Van den Bergh and Verbruggen 1999); anthropogenic climate change, unsustainable use of land and natural resources (Corson 1994); and unsustainable infrastructure, among others (Mirza 2006; Dentinho 2011; Banai 2016). Physical: Although there is a global concern about climate change, different nations and regions experience the threat of climate change differently. For instance, global warming threatens the existence of the arctic region by reducing the ice cover; coastal regions are threatened by rising sea levels and frequent tsunamis; and arid regions are threatened by increasing desertification, frequent wildfires, and severe shortages of water. Sustainability, first and foremost, is about continuity—existence or survival—of a system. Therefore, the physical sustainability aspects of specific regions also need to be considered. For many systems, including natural and mechanical systems, the physical existence is the key to its sustainability. If the physical existence of a system is threatened, its sustainability is in question. Physical sustainability must be concerned with anything that threatens the physical existence of a region and well-being of its inhabitants. The concerns of physical sustainability have received attention from both sustainability scholars (Howe 1997; Seghezzo 2009) as well as many resilience scholars (Bocchini et al. 2013; Derissen 2014; Fainstein 2015). Howe (1997) and Seghezzo (2009) respectively discuss physical sustainability issues under “geography” and “place” as dimensions of sustainability. Social: Social sustainability includes concerns of persistent poverty and high levels of inequality (Campbell 1996; Seghezzo 2009; Singh et al. 2009); issues of social and environmental justice (Berke and Conroy 2000; Krueger and Savage 2007); concerns of health and well-being (Budd et al. 2008; Galli et al. 2015); as well as concerns of affordable housing and education (Wheeler 2000; Ward and Jonas 2004; Mori and Christodoulou 2012). Another important concern of social sustainability is “quality of life”. Many scholars recognize that improving the quality of life is one of the concerns of sustainability and sustainable development (Allen 1980; Mori and Christodoulou 2012). Economic: This includes concerns for prosperity (European Commission 2002); sustained economic growth (Singh et al. 2009); and smart economic growth—growth with concerns for equity and environment (Krueger and Agyeman 2005). Economic sustainability is concerned with improving the quality of people’s lives rather than merely increasing the output (Corson 1994). Stability of production, consumption, and income is also considered indicative of economic sustainability (Hopton et al. 2010). With business organizations joining the sustainability discourse, concerns of profits and financial sustainability have also become pertinent to economic sustainability (Elkington 1997). This discussion demonstrates that regional sustainability has its own set of concerns and issues, which may not be similar to the concerns of sustainability in another context. Next, I proceed to answer why one should pursue sustainability. The pursuit of sustainability is important for practical as well as ethical reasons. Although the pursuit of sustainability is considered highly desirable by many scholars and practitioners, there has been some opposition to the sustainability movement from conservative scholars and policymakers in many countries, including the United States. While some critics deny the concerns of sustainability such as global warming and climate change (McCright and Dunlap 2011; Leiserowitz et al. 2011; Leviston et al. 2011), others question sustainability discourse by accusing the concerns raised therein as vastly overstated and the sustainability goals as unrealistic and utopian (Schaefer and Miller 2015). Some critics of sustainability view the concerns about environment and climate change—core concerns of sustainability—as harmful to economic growth (Antonelli, Schaefer, and Annett 1997; Schaefer and Miller 2015). The public opinion regarding climate change is also polarized with mostly liberals showing concerns about global warming whereas conservatives mostly remain indifferent or in denial mode about global warming and climate change (Antonelli et al. 1997; McCright and Dunlap 2011). Therefore, it is essential to consider the arguments for sustainability from both practical as well as ethical perspectives in order to understand why the pursuit of sustainability is important and how it can benefit the society. From a practical standpoint, the current generation needs to pursue sustainability in order to be able to live a healthy and prosperous life. From an ethical perspective, the pursuit of sustainability is needed to make sure that everyone in the current generation, as well as in the future generations can live up to their full potentials. With growing world population, constant or depleting natural resources such as land, water, and nonrenewable energy, deteriorating environmental and climatic conditions, and rising income inequality, the sustainability of the ecosystem is a matter of concern. In the context of global warming and climate change, it is argued that given the unsustainable direction the world is going, everyone should be concerned about sustainability (Foster 2014: 1–2). In order to highlight the need to pursue sustainability, the United Nations’ High-Level Panel on Global Sustainability notes that eradicating poverty, reducing inequality, making growth inclusive and production and consumption more sustainable, while combating climate change are “the central challenges of our time” (Marien 2012). Besides the global realization about the need to promote sustainability, it is an important concern in the United States as well. Citing devastating incidents such as the Flint water crisis, hurricanes Irma and Harvey, and high levels of poverty in states such as California, Florida, and Louisiana, scholars argue that sustainability is an important concern for all Americans (Opp, Mosier, and Osgood Jr 2018). According to the US Environmental Protection Agency (EPA), “Everything that we need for our survival and well-being depends, either directly or indirectly, on our natural environment.” (National Research Council 2011: 15). Therefore, pursuit of sustainability is for common good. The US EPA further notes that pursuing sustainability implies creating and maintaining conditions that allow humans and nature to exist in “productive harmony to support present and future generations” (US EPA 2017). Sustainability is not just a way out of certain practical challenges; it is a moral imperative. Shearman (1990) argues that if we—the current generation of humans—care about “living well” not only for ourselves but also for the future generations, then considerations of sustainability is a moral imperative. Sustainability is both an evaluative and a normative concept with an inherent ethical dimension to it (Becker 2011: 1). Howarth (1995) asserts that “each successive generation holds a moral duty to ensure that the expected welfare of its children is no less than its own perceived well-being” (p. 425). Sustainability and justice are related in the sense that the concept of sustainability requires people to think about sustaining something into the future and the concept of justice makes people think about distributing or redistributing something across present and future (Dobson 1999). In what follows, I make a case for sustainability as an ethical concept. Ethics can be defined as the philosophical study of morality (Feldman 1978: 1), the study of right and wrong behavior (Fieser and Dowden 2011), or a system of moral principles (BBC 2014). To distinguish ethics from morality, Hazels notes that ethics is comprised of a set of rules or codes that a group or society abides by, whereas morality tends to be more personal (Hazels 2015). Ethics is not only about our self-interest but also about others’ interests and concerns for their well-being (BBC, 2014). The concepts of ethics are derived from multiple sources including religions, human conscience and intuition, philosophies, and different cultures (Singer 2013: 1–3). As a result, there are different types of ethical arguments: (1) religious and cultural; (2) consequentialist (including utilitarianism); and (3) deontological. Different ethical approaches inform actors of ethical concerns and help determine whether an action is right or wrong and whether one alternative is preferable to another. A number of religious and cultural traditions advocate for sustainability in some sense, at least. For instance, the Abrahamic religious traditions—Islamic, Christian, and Judaic—consider human beings as trustees of the world and the natural resources therein (Weiss 1992; Denny 1998; Marinova, Hossain, and Hossain-Rhaman 2008). In these traditions, the utilization and sustainable use of natural resources is the right and privilege of all people. By this principle, one group of people should make sure that the interests and rights of other people are protected. This provides a basis for intra- and inter-generational justice between different groups, regions, and nationalities. Similar to these traditions, Weiss observes that African customary laws and non-theistic traditions prevalent in Asia, such as Shintoism, also emphasize “respect for nature and for our responsibilities to future generations as stewards of this planet.” (Weiss 1992: 9). While religious traditions and cultural practices may provide some motivation for achieving sustainability, these are neither comprehensive nor universally acceptable. Therefore, to offer a more robust defense of sustainability as an ethical concept, I focus on the two main approaches: deontological ethics and consequentialist ethics. Besides religious and cultural traditions, the considerations of sustainability are also informed and guided by two main ethical approaches: deontological approach, which is concerned with the question of rightness or wrongness of actions, and consequentialist approach, which is concerned with the results of actions (Becker 2011: 19; Alexander and Moore 2007). The scholars of deontological ethics argue that actions themselves should be judged morally, irrespective of their consequences. An action deemed right should be done and an action considered wrong should not be done. This school of thought is identified with (Kantian) deontological or duty-based school of ethics (Mastin 2008). A number of deontologists look at actions from a contractarian perspective. They are concerned about whether an action is approved by the social contract (Alexander and Moore 2007). Consequentialist scholars, on the other hand, argue that people should only be concerned about the consequences of their actions. According to the consequentialists, only the actions that have the best consequences or cause the least harm should be undertaken. This school of thoughts is aligned with the consequentialist or utilitarian school of ethics (Mastin 2008). Having identified the two main ethical arguments, I now shed light on who should care for sustainability, and why one should be concerned at all. Who should care about sustainability and why? I argue that we—the living generation—should care about sustainability because (1) we are, to a large extent, responsible for the present unsustainable situation, characterized by unsustainable consumption, production, and development patterns (FAO 1994; UNEP 2012; Madhavan and Barrass 2011; Malik 2018); (2) if we do not take action to attain a sustainable path to development, the consequences of unsustainable consumption, production, and development could be dire; and (3) it is our duty toward others, future generations, and the environment. Some of the responsibility of caring for sustainability follows from the standpoint of consequentialist ethics whereas some follow directly from the deontological standpoint. Barry argues that future generations should not be worse off than we are because of our actions (Barry 1997). Therefore, it is our responsibility to make sure that we leave the environment in a condition similar to, or better than, what we inherited from our forefathers (Barry 1997). Thus, the responsibility of making reparations naturally falls on us—the current generation. Another consequentialist argument is that environmental problems can have serious social and political effects. If adequate measures are not taken to control the environmental degradation and reverse the trend of unsustainable policies and processes, the human society as well as the non-human environment will be in danger because of the lack of the natural resources or their poor quality (Guillebaud 2014; Nazaruk 2016). Environmental change may shift the balance of power between states and countries that can potentially lead to serious conflicts and even war between countries (Wirth 1989; Homer-Dixon 1991). Global warming and climate change can lead to massive migration of people from one region to another in search of habitat and work. As a result, regions and countries may find themselves engaged in “acute conflict, including scarcity disputes between countries, clashes between ethnic groups, and civil strife and insurgency, each with potentially serious repercussions” (Homer-Dixon 1991: 78). In order to avoid such situations, nations must work toward attaining sustainability. From a deontological standpoint, rights and obligations-based arguments uphold the view that ensuring sustainability is a duty of the current generations (Anand and Sen 2000). Anand and Sen argue that the current generation as well as the future generations have a rights-based claim on the resources and capital stock of the society. Invoking the concept of ethical universalism—which demands that every generation has an equal claim on the social and natural capital—Anand and Sen argue that the current generation only has “usufruct rights”, or right of use, over the society’s broad stock of capital. We are, therefore, not supposed to deplete the total stock. This implies that preserving productive capacity, or society’s broad stock of capital, is a duty of the current generation. A number of scholars also make obligations-based argument regarding sustainability. The current generation has an obligation to allow the future generation “to be as well off as we are” at the least (Solow 1991). Obligations-based arguments provide strong reasons to protect the natural world including non-human beings and offer a number of reasons for “act-oriented ethical reasoning to take obligations rather than rights as basic” (O’Neill 1997). The principal advantage of considering obligations as basic is that even if some rights are not human rights, all obligations are human obligations (Barry 1997). O’Neill (1997) notes that most of the consequentialist rights-based arguments draw our attention to living beings or sentient beings and therefore such arguments may not have much implications for non-sentient elements of nature. O’Neill extends this obligation to all sentient beings and non-sentient objects including the universe arguing that we have an obligation to protect the natural world. Thus, concerns for sustainability follow from and supported by both consequentialism as well as deontological approaches to ethics. Having established that sustainability is a matter of concern for us—the current generations—with the help of ethical principles, I now focus on how sustainability promotes ethical processes and practices. Utilitarian ethics suggests that we must adopt sustainable technology, processes, and practices if those maximize our utility (Mastin 2008). Given the fact that sustainable development aims “to promote prosperity” for all “while protecting the planet” (United Nations 2016), it becomes imperative to work for achieving sustainability in our development efforts. In addition to this, I claim that efforts made to achieve sustainability can help us ensure social justice. In what follows, I discuss how different sustainability initiatives can help achieve a greater degree of social justice. Concerns for sustainability include both temporal and spatial concerns of justice. Temporal concerns of justice include aspirations to achieve justice within the current generation as well as between the current and future generations; whereas spatial concerns include aspiration to achieve justice among different (subnational) regions, states, nations, and (supranational) regions. Sustainability is concerned with issues of social and economic justice such as poverty, inequality, inequity, health and wellbeing, disempowerment, and other forms of deprivation. The sustainable development goals also include reducing poverty and inequality within countries as well as between countries (United Nations 2016a). Fighting poverty is akin to fighting injustice, as it has been observed that “the persistence, aggravation and very existence of extreme poverty constitute an injustice” (United Nations 2006: 1). It is important to reduce inequalities because evidence suggests that “beyond a certain threshold, inequality harms growth and poverty reduction, the quality of relations in the public and political spheres and individuals’ sense of fulfilment and self-worth” (United Nations 2014). Another argument is that inequality should be fought against, because it is the antecedent and outcome of injustice (Dorling and Dorling 2015: 23–25). Similarly, environmental justice is another concern of sustainability. Thus, by promoting sustainability, societies and nations can ensure environmental justice to their respective citizens. This implies that implementing the United Nations’ sustainable development goals, which include reducing poverty and inequality and ensuring environmental protection and justice, is akin to implementing social justice. In most countries, sustainability initiatives have been top-down at first, with international agencies and national governments driving the initiatives. However, following the Rio Earth Summit in 1992, there has been considerable interest from the subnational—local and regional—governments toward pursuing sustainability (Happaerts 2012; Bruyninckx et al. 2012; Jörgensen, Jogesh, and Mishra 2015). Figure 2 shows a three-tiered concept—with micro, meso, and macro levels—for governing sustainability initiatives with only three regions and seven localities. In practice, however, the numbers of regions and localities are far greater in any country. Also, typically there is a wide variation in size, population, and number of localities within a region. In the US, the federal government and a few states have undertaken multiple sustainability initiatives. In addition, a large number of cities and towns have also adopted sustainability initiatives following a bottom-up approach (Portney 2003; Jepson Jr 2004; Saha 2008). Recently, many regional organizations have also launched sustainability initiatives in their respective regions (Alexander 2010; Chapple and Mattiuzzi 2013; Mattiuzzi 2017). However, the question is: which is the best approach for promoting sustainability in the US, if there exists one? In order to answer this question, I argue that a regional approach can provide the best alternative to promote sustainability in the US. The answer to this question is twofold. On one hand, it is argued that both top-down approach, led by the federal and state governments, as well as bottom-up approaches, adopted by individual localities, are likely to result in ineffective and inefficient outcomes. On the other hand, it can be argued that a regional approach to sustainability is desirable and has many advantages over top-down or bottom-up approaches. In what follows, I first discuss the disadvantages of top-down and bottom-up approaches, followed by arguments in favor of a regional approach to sustainability in the US. Both the national and state level efforts to promote sustainability suffer from two sets of criticism. Firstly, the federal government and the state governments are often influenced by political ideologies and interest groups that might not consider promoting sustainability as one of their priorities (Blinder 1997; McCright and Dunlap 2011; Leiserowitz et al. 2011; Whittemore 2013). In such situations, sustainability cannot be achieved by a top-down approach only. Secondly, the federal and the state governments are too big and do not necessarily have the best understanding of the regional issues and concerns of each regions (Moss 2010; Howard 2012). Thus, they lack the capacity to effectively and efficiently promote regional sustainability. Locality-based approaches, on the other hand, face a number of criticisms. One of the foremost criticisms of localism is that it contributes to sprawl and perpetuates social and economic segregation (Cashin 1999; Briffault 2000; Troutt 2007). Briffault (2000) argues that the local government system encourages sprawl by allowing suburbs to attract wealthier residents leaving poorer sections in the central cities, which further contributes to poverty. Both sprawl and segregation contribute to regional unsustainability, as sprawl tends to increase pollution and segregation inflicts injustice upon certain communities of people. Although the local government system is not solely responsible for urban poverty, it plays a significant role in perpetuating urban poverty (Briffault 2000). Another criticism of localism is that it encourages fragmentation, which allows many governments in a given social and economic space (Wood 1958; Fischel 1999). According to the 2012 Census of Governments, there are 90,056 local governments in the US scattered across the 50 states and Washington D.C. These local governments include 38,910 general purpose governments and 51,146 special purpose governments. General purpose governments are divided into categories such as counties (3,031), municipalities (19,519), and townships (16,360) (U.S. Census Bureau 2012; Hogue 2013). Every major metropolitan area has dozens of local governments. For example, Chicago and Boston metropolitan regions have over 1,000 local governments each. A large number of local governments trying to rule over a common socioeconomic space can result in duplication of services and overlapping programs and policies (Ostrom, Tiebout, and Warren 1961). Too many governments trying to govern a common metropolitan area can lead to mutually contradictory rules and regulations. This is likely to result in ineffective, inefficient, fragile initiatives (Dijkstra and Fredriksson 2010; Hodson and Marvin 2017). This can hurt environmental protection as well as social services. Regionalists claim that local governments are often myopic; they look for their immediate economic interests and tend to ignore the longer-term perspective (Peterson 1981; Logan and Molotch 1987). This preference for short-term gain can go against the prospects of long-term social and environmental sustainability as localities compete with each other for their economic interests which can affect both tax revenues and regional ecosystem, thus jeopardizing the sustainability of the region as whole (Portney 2003; Oates and Portney 2003; Bush 2012). Both scholars and practitioners argue that ecosystem problems do not respect the local jurisdictional boundaries and hence it is difficult to solve regional problems with fragmented locality-based approaches (Ostrom, Tiebout, and Warren 1961; Briffault 2000; Saha 2008; Keeney et al. 2015). Individual localities may not have the capacity to tackle big regional problems and so they cannot contribute much to the regional sustainability. Thus, top-down or locality based approaches are neither sufficient nor the most appropriate approaches to promote sustainability in the US. In what follows, I argue that a regional approach may provide the most appropriate mechanism to promote sustainability in the US. Regional approach to sustainability makes sense because of two reasons. On one hand, promoting sustainability at the regional level is desirable from both practical and normative points of view, as there are many issues that affect the normal functioning, well-being of people, and the ecosystems in different regions. Regions, in order to sustain, function properly, and prosper, need to address such issues. It is important for policymakers, planners, developers, and scholars to focus on the sustainability of city regions because decisions and policies regarding the physical environment of the region—the city, the suburbs, and the periphery—has significant consequences “for its citizens’ sense of well-being, as well as ecological consequences” (Lennard, von Ungern-Sternberg, and Lennard 1997). Moreover, by promoting sustainability, regions can play a prominent role in creating and maintaining “conditions under which humans and nature can exist in productive harmony, that permit fulfilling the social, economic and other requirements of present and future generations” as envisioned by the National Environmental Policy Act of 1969 (US Congress 1969: 1–2). On the other hand, there are a number of arguments suggesting that in the US, regional approaches—as opposed to the federal or state government and locality-based initiatives—are better positioned to promote sustainability (Wheeler 2000; Ziegler 2009; Banai 2013). Many arguments supporting the view that regions are strategically positioned to promote sustainability can be drawn from the literature on regionalism. Regionalism focuses on interests of particular regions, as opposed to individual localities or larger administrative units such as states or countries. It aims to “reorganize a particular regional space along defined economic and political lines” (Gamble and Payne 1996: 2). Regionalism offers arguments in favor of a regional approach to planning, land use, and economic growth (Dahl and Tufte 1973: 39; Savitch and Vogel 2000: 160; Stephens and Wikstrom 2000: 39). Regional approaches can be efficient because at this level, there is a strong connection and fit between “physical functions, social identity, economic units and political territories” (McEvoy and Ravetz 2001: 90). A subset of regionalist arguments labelled as “new regionalism” views regions as a scale at which global competitiveness can be achieved. New regionalism emphasizes coordination and cooperation among localities for economic competitiveness (Wallis 1994; Olberding 2002; Frank and Marsden 2016). While traditional regionalism argues that a regional approach is more efficient and has a competitive edge over locality-based approaches (Wood 1958; Ostrom, Tiebout, and Warren 1961; Ziegler 2009), “new regionalism” points out the benefits of coordination and cooperation from a regional approach in planning and implementation of economic development policies and programs (Olberding 2002; Bush 2012). Another strand of regionalism, sometimes labelled as “progressive new regionalism”, advocates for an ecologically sustainable, redistributive metropolitan regime (Sites 2004). In what follows, I discuss multiple arguments supporting a regional approach to sustainability based on scale, effectiveness, efficiency, synergy, competitiveness, integration, and policy diffusion. Scale: Regions can provide the most effective geographical scale to promote, analyze, and evaluate sustainability (Wheeler 2000; Calthorpe and Fulton 2001; Banai 2013). Regionalists argue that “the real city is the total metropolitan area” (Briffault 2000). Briffault further notes that in metropolitan areas, region is often the economically, socially, and ecologically relevant local area. In addition, a regional approach to sustainability “brings opportunities to improve on the current state of fragmentation, offering new linkages for the sustainable development agenda at a level between local and national scales” (McEvoy and Ravetz 2001: 90–91). Banai (2013) discusses the advantages of metropolitan regions as units of analysis for sustainability policies and demonstrates that a regional approach to sustainability may be the most appropriate move for sustainable urban and regional development. Furthermore, Banai notes that regional cities or polycentric metropolitan regions with “linked mixed-use centers, multi-modal corridors, multi-functional districts, and natural preserves” are considered urban forms of the future (Banai 2016: 1). Therefore, it makes sense to consider the entire metropolitan region for promoting sustainability. Effectiveness: A regional approach to solving complex problems can be more effective than fragmented approaches. Some of the most prominent issues pertinent to regional sustainability are urban sprawl; use of land and natural resources; transportation, mobility and connectivity; ecological footprint; built and natural environment; resilience and adaptive capacity; climate change and sea-level rise; economic growth and development; poverty, inequality, and inequity; quality of life; social issues such as health, education, race, community, cultural issues; and spatial issues such as sense of place. Many of these issues pose significant challenges for regions in the short run and also threaten regional sustainability in the long run. Considering weak coordination between localities, the critics of localism argue that independent actions of multiple localities within a region cannot comprehensively address such regional issues (Crowder 2014). From a practical standpoint, regions have to address such issues in order to sustain, function properly, and prosper. Furthermore, according to Wheeler (2000, p. 270), “Regional efforts to limit sprawl, create compact communities, revitalize existing urban centers, produce more equitable distribution of resources, preserve natural ecosystems, and reduce resource use, pollution, and automobile use” can contribute to sustainable development. Thus, sustainability can be more effectively promoted by addressing problems and issues that affect the sustainability of an entire region. Efficiency: A regional approach to address issues that concern multiple localities can be more efficient than locality based approaches. Many urban and rural problems span the jurisdictional boundaries of localities. To address these issues, region-wide initiatives are required. If individual localities take initiatives to address such issues, they are likely to create duplicate policies and programs and generate externalities or spillovers (Ostrom, Tiebout, and Warren 1961). The net result is likely to be inefficient or even ineffective. A regional approach to solve these problems can internalize externalities and control spillovers better than most localities can. Considering the inefficiencies and externalities produced by different localities making policies for land use and environmental protection, Bush (2012) argues that a regional approach to land use and environmental protection would lead to better policies and outcomes. Furthermore, scholars argue that a regional approach to development can help overcome inefficiencies and policy fragmentation that arises from urban sprawl (Healey 1997: 7; Kübler and Schwab 2007; Frank and Marsden 2016). This implies that a regional approach can be more efficient in solving problems and promoting sustainable development than fragmented approaches by individual localities. Competitiveness: The proponents of regional competitiveness argue that fragmentation reduces productivity and that metropolitan regions along with their adjacent territories provide the spatial environment for economic competition. It is argued that metropolitan regions are the units of economic competition (Hershberg 1996; Foster 1997) and that in order to compete globally, cities and suburbs have to improve their socioeconomic profile together (Briffault 2000). Briffault points out that “regions will be hampered in their ability to engage in economic competition unless they address their internal economic and social inequities” (Briffault 2000: 8). Regional cooperation allows localities to come together on a mutually shared interest— achieving economic competitiveness. Similar to the economic competitiveness argument, Crowder (2014) advances a new social justice framework—regional interest convergence—to make a case that multiple jurisdictions within a region may find it mutually beneficial to address the issues of poverty and inequality at a regional level. Regional cooperation can also help localities avoid a “race to the bottom” of taxes, environmental regulations, and welfare policies by removing the interlocal competition in such policy domains (Oates and Portney 2003; Heichel, Pape, and Sommerer 2005). Synergy: Proponents of regionalism argue that regional approaches to solve complex inter-local problems and to promote sustainability would be able to garner cooperation and coordination among localities that individual localities cannot. Individual localities cannot solve problems such as sprawl or urban poverty, as these are regional problems (Crowder 2014). For addressing regional concerns such as sprawl and poverty, “some strong region wide mechanism” is required for coordinating different initiatives and actions and only a regional approach can provide that (Briffault 2000). A regional approach allows localities to come together to advance shared interests and address common concerns such as achieving economic competitiveness, solving the problem of urban poverty, or urban environmental concerns (Gibbs 1998; Briffault 2000; Crowder 2014; Frank and Marsden 2016). Regions can develop new policies aimed at economic sustainability by promoting investment in environment-technology sectors, creating jobs through environmental improvement, and devising local indicators of sustainability for such policies (Gibbs 1998). Integration: Another argument is that regional approaches to sustainable development can provide integrated spatial or institutional frameworks to promote sustainability (McEvoy and Ravetz 2001). A number of scholars demonstrate how a regional approach in different policy domains such as urban sprawl, environmental protection, and fighting poverty and inequality can be helpful in promoting sustainability. For instance, city regions can provide a platform for green space planning and climate change mitigation (Frank and Morgan 2012). Based on a comprehensive approach to regionalism—that includes the urban as well as adjacent rural areas, scholars have proposed regional level planning as a potential mechanism for promoting sustainable development (Roberts 1997; Orfield 1997; Frank and Marsden 2016). Furthermore, regional approach to environmental management can provide “a sustainable, adaptable and resilient regulatory system that effectively responds to persistent and changing environmental problems” (Williams 2013: 1090). Policy Diffusion: A regional approach to sustainability can also play an important role the diffusion of federal and different state government policies. A number of sustainability policies are initiated at the federal or state levels. Regional organizations can take initiatives to implement those policies in their respective regions. This is likely to create awareness as well as motivation among members to adopt such policies. Regional organizations, acting as “bridging organizations”, can play key roles in forming linkages, increasing grassroots influence on policy, and disseminate the vision for sustainability adopted at the regional level (Brown 1991). This article conceptualizes sustainability in terms of environmental, physical, social, and economic dimensions of sustainability. This conceptualization also recognizes the two goals of sustainability: continuity and aspiration. In this article, I summarize a number of normative and ethical arguments regarding sustainability and demonstrate that pursuing sustainability goals is not just about fulfilling moral responsibilities, but the pursuit of sustainability can also benefit the society as a whole. Lastly, I claim that in the context of the US, regional approach to promoting sustainability is a better approach than top-down or locality based approaches. Drawing from arguments for regional economic competitiveness, environmental protection, and poverty and inequality reduction, I argue that regions—comprising of multiple jurisdictions—can be the most effective units of intervention and analysis for sustainability goals because (1) regions provide the geographical scale necessary for promoting sustainability; (2) a regional organization can provide the governance mechanism required to achieve the necessary cooperation and coordination among localities; and (3) a regional body can avoid making duplicate policies, and take into account externalities and spillovers, while making regional plans and implementing development programs. Offering a clear view of the concept of sustainability and ethical as well as practical explanation for promoting sustainability with a regional approach, this article paves the way for new research in the area of regional sustainability. To further the research agenda, I make the following observations. While a number of scholars have studied the adoption of sustainability policies in various cities (Portney 2003; Jepson 2004; Saha 2008), scholarship on regional sustainability is thin. Therefore, to what extent regional organizations have adopted and implemented sustainability initiatives is not clear. In the absence of general purpose governments at the regional level, future research should focus on the potential role of regional organizations in promoting sustainability and the factors that influence or deter sustainability initiatives by regional organizations. It is also important to learn what incentives these organizations have to promote sustainability and what constraints they face in doing so. This will inform scholars and practitioners as to what needs to be done in order to strengthen these organizations for promoting sustainability in their respective regions and beyond. Alexander, Larry, and Michael Moore. 2007. ‘Deontological ethics’. The Stanford Encyclopedia of Philosophy. Alexander, Lisa T. 2010. ‘The Promise and Perils of New Regionalist Approaches to Sustainable Communities’. Fordham Urb. LJ 38: 629. Allen, Robert. 1980. How to save the world. Strategy for world conservation (Kogan Page Ltd.). Antonelli, Angela, Brett D. Schaefer, and Alex Annett. 1997. ‘The Road to Kyoto: How the Global Climate Treaty Fosters Economic Impoverishment and Endangers US Sovereignty’. Backgrounder. Becker, Christian. 2011. Sustainability ethics and sustainability research (Springer Science & Business Media). Brundtland, Gro Harlem. 1987. Report of the World Commission on environment and development: “our common future.” (United Nations). Bush, Brittan J. 2012. ‘A New Regionalist Perspective on Land Use and the Environment’. Howard LJ 56: 207. Calthorpe, Peter, and William Fulton. 2001. The regional city (Island Press). Cashin, Sheryll D. 1999. ‘Localism, self-interest, and the tyranny of the favored quarter: addressing the barriers to new regionalism’. Geo. LJ 88: 1985. Chapin, F. Stuart III, Gary P. Kofinas, Carl Folke, and Melissa C. Chapin. 2009. Principles of ecosystem stewardship: resilience-based natural resource management in a changing world (Springer Science & Business Media). Chapple, Karen, and Elizabeth Mattiuzzi. 2013. ‘Planting the Seeds for a Sustainable Future: HUD’s Sustainable Communities Initiative Regional Planning Grant Program’. Center for Community Innovation 28080713: 29. http://communityinnovation.berkeley.edu/SCIRPGFinal. Crowder, Patience A. 2014. ‘(Sub) Urban Poverty and Regional Interest Convergence’. Marq. L. Rev. 98: 763. Dahl, Robert Alan, and Edward R. Tufte. 1973. Size and democracy (Stanford University Press). Denny, Frederick M. 1998. ‘Islam and Ecology: A Bestowed Trust Inviting Balanced Stewardship’. Earth Ethics 10: 10–12. Derissen, Sandra. 2014. ‘Managing ecological-economic systems under uncertainty-from concepts to contracts’. Christian-Albrechts Universität Kiel. Dobson, Andrew. 1999. ‘Fairness and futurity: essays on environmental sustainability and social justice’. Dorling, Daniel, and Danny Dorling. 2015. Injustice (revised edition): Why social inequality still persists (Policy Press). Elkington, John. 1997. ‘Cannibals with forks’. The triple bottom line of 21st century: 73. Feldman, Fred. 1978. ‘Introductory ethics’. Englewood Cliffs. New Jersey: Prentice-Hall, Inc.
Fieser, James, and Bradley Dowden. 2011. ‘Internet encyclopedia of philosophy’. Fischel, William A. 1999. ‘Does the American way of zoning cause the suburbs of metropolitan areas to be too spread out?’. Governance and opportunity in metropolitan America 15: 1–19. Frank, Andrea Irmgard, and Kevin John Morgan. 2012. ‘Re-inventing the city: The art of metro-governance in the Stuttgart region’. Guillebaud, J. 2014. “There are not enough resources to support the world’s population. ABC Radio National.” In: Australian Broadcasting Corporation. Hazels, Tabetha. 2015. ‘Ethics and Morality: What Should Be Taught in Business Law?’. Academy of Educational Leadership Journal 19: 77. Healey, Patsy. 1997. Collaborative planning: Shaping places in fragmented societies (UBc Press). Hodson, Mike, and Simon Marvin. 2017. ‘The mutual construction of urban retrofit and scale: Governing ON, IN and WITH in Greater Manchester’. Environment and Planning C: Politics and Space 35: 1198–217. Hogue, Carma. 2013. ‘Government organization summary report: 2012’. United States Census Bureau. Howard, Philip K. 2012. ‘The U.S. Government Is Too Big to Succeed’. The Atlantic, March 3. Jacobs, Michael. 1999. ‘Sustainable development as a contested concept’. Keeney, Michael S., Faluke Aishanjiang, Sarah Halvorson-Fried, and Shahidur R. Talukdar. 2015. ‘Regional Economic Development’. A Report Published By Virginia Tech. Leiserowitz, Anthony, Edward Maibach, Connie Roser-Renouf, and Nicholas Smith. 2011. ‘Global warming’s six Americas, May 2011’. Yale University and George Mason University. Lennard, Suzanne H. Crowhurst, Sven von Ungern-Sternberg, and Henry L. Lennard. 1997. “Making cities livable.” In: International making cities livable conferences. Leviston, Zoe, Anne Leitch, Murni Greenhill, Rosemary Leonard, and Iain Walker. 2011. ‘Australians’ views of climate change’. Canberra: CSIRO. Logan, John, and Harvey Molotch. 1987. “Urban fortunes.” In: Berkeley: University of California Press. Marinova, Dora, Amzad Hossain, and Popie Hossain-Rhaman. 2008. ‘Islam on sustainability’. International Journal of Environmental, Cultural, Economic and Social Sustainability 4: 123–30. Mastin, L. 2008. ‘Ethics: Deontology’. The Basics of Philosophy. http://www.philosophybasics.com/branch_ethics.html. Mattiuzzi, Elizabeth. 2017. ‘Impacts of the Sustainable Communities Initiative on Regional Collaboration, Equity, and Planning: Results of a Survey of Grantee Regions’. Cityscape 19: 39–62. Meadows, Donella H., Dennis L. Meadows, Jorgen Randers, and William W. Behrens. 1972. ‘The limits to growth’. New York 102: 27. Moss, Todd. 2010. ‘Too big to succeed? Why (w)hole-of-government cannot work for US development policy’. Global Development: Views from the Center: 10. Opp, Susan M., Samantha L. Mosier, and Jeffery L. Osgood Jr. 2018. Performance Measurement in Local Sustainability Policy (Routledge). Orfield, M. 1997. ‘Metropolitics: A regional agenda for community and stability. Washington, DC: Brookings Institution. Perle’. Perspectives on the changing ecological structure of suburbia. Urban Geography 2: 237–54. Portney, Kent E. 2003. Taking sustainable cities seriously: Economic development, the environment, and quality of life in American cities (MIT Press). Saha, Devashree. 2008. Sustainable cities: Agenda setting and implementation of sustainability initiatives in US cities (The University of Texas at Austin). Singer, Peter. 2013. A companion to ethics (John Wiley & Sons). Sohn, Louis B. 1973. ‘Stockholm Declaration on the Human Environment, The’. Harv. Int’l. LJ 14: 423. Solow, Robert Merton. 1991. ‘Sustainability: an economist’s perspective’. Stephens, G. Ross, and Nelson Wikstrom. 2000. Metropolitan government and governance: Theoretical perspectives, empirical analysis, and the future (Oxford University Press on Demand). Troutt, David D. 2007. ‘Katrina’s Window: Localism, Resergregation, and Equitable Regionalism’. Buff. L. Rev. 55: 1109. U.S. Census Bureau. 2012. ‘2012 Census of Governments: Organization Component’. Census.gov. Van den Bergh, Jeroen C.J.M., and Harmen Verbruggen. 1999. ‘Spatial sustainability, trade and indicators: an evaluation of the ‘ecological footprint’’. Ecological economics 29: 61–72. Weiss, Edith Brown. 1992. ‘In fairness to future generations and sustainable development’. Am. UJ Int’l L. & Pol’y 8: 19. Williams, Douglas R. 2013. ‘Toward Regional Governance in Environmental Law’. Akron L. Rev. 46: 1047. Ziegler, Edward H. 2009. ‘The case for megapolitan growth management in the 21st century: Regional urban planning and sustainable development in the United States’. The Urban Lawyer: 147–82.